IBPS PO VIII Mains Score Card (Shortlisted for Interview Candidates) Check Here. 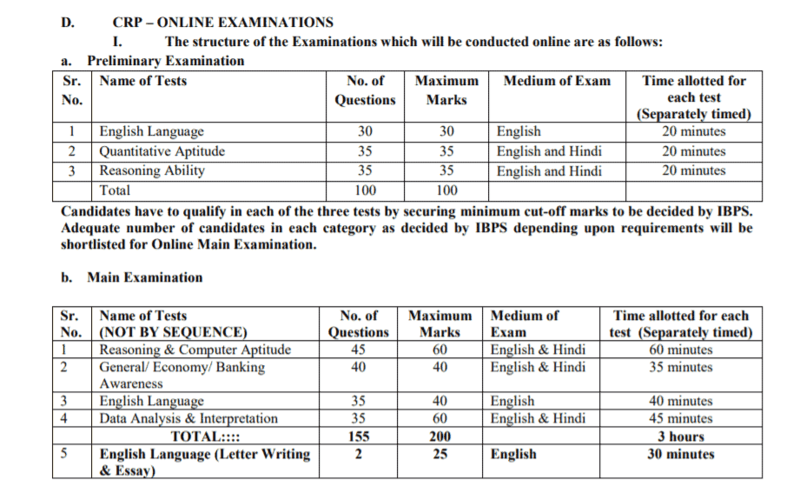 IBPS PO VIII Mains Score Card Check Here. IBPS PO VIII Mains Result 2018 Check Here. IBPS PO VIII Score Card 2018 Check Here. IBPS PO Pre Exam Result 2018. IBPS PO VIII Interview Letter Check Here. IBPS PO Mains Admit Card 2018 Check Here. IBPS PO Online Exam Admit Card 2018 Check Here. IBPS PO Pre Exam Training Admit Card 2018. IBPS Notification is out. IBPS is recruiting for 4102 PO VIII Post 2018 Mains Score Card Posts. You can check IBPS - Institute of Banking Personnel Selection last date, download IBPS notification, visit IBPS official website and check other IBPS Vacancy details.Complete Vacancy and recruitment Details about 4102 PO VIII Post 2018 Mains Score Card vacancies in IBPS are provided below by JobSarkari.Com only for you. Last Date for Payment of Fees 04/09/2018. Conduct of Pre-Exam Training 01/10/2018 to 07/10/2018. Download Call Letters October 2018. Mode of Payment Application fees Can be Submitted through Online Mode Only. Allahabad Bank 395 212 118 59 784. Bank of India 489 260 144 72 965. Canara Bank 606 324 180 90 1200. Corporation Bank 42 21 15 06 84. UCO Bank 242 196 83 29 550. Union Bank of India 259 172 59 29 519. Total No of Post 2033 1185 599 285 4102. Candidate Must Have Passed Graduation in Any Stream. Age Relaxation Upper Age Limit is Relaxable by 05 Years for SC / ST and 03 Years for OBC Candidates. There will be penalty for wrong answers given by the candidate one fourth or 0.25 of the marks for Every Wrong Answer. 2.Each candidate Have to obtain a minimum score in each test of Online Main examination and also a minimum total score to shortlisted for interview. 5.Upload the Photograph and Signature in the JPEG Format in the Prescribed Size along With Other Documents. 7.Online Application Can be Submitted on or Before 04th September 2018. Q. 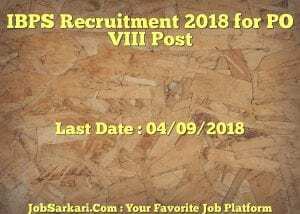 What is the Last Date For IBPS PO VIII Post 2018 Mains Score Card Vacancy ? A. Last Date for IBPS PO VIII Post 2018 Mains Score Card Posts is 04/09/2018. Q. 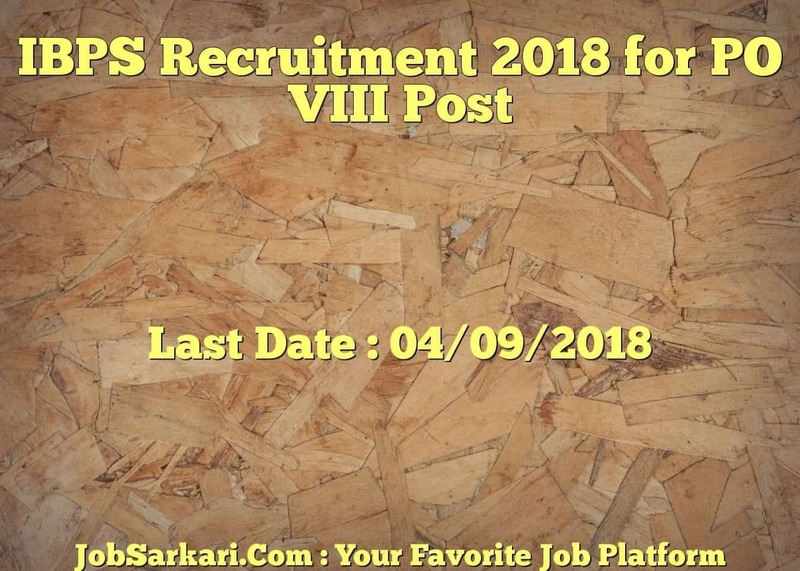 What is the Form Type of IBPS PO VIII Post 2018 Mains Score Card Recruitment ? A. The Form Type for IBPS PO VIII Post 2018 Mains Score Card Posts is Online. Q. How many vacancies are available in Institute of Banking Personnel Selection PO VIII Post 2018 Mains Score Card Posts ? A. There are about 4000 Vacancies in Institute of Banking Personnel Selection PO VIII Post 2018 Mains Score Card Posts. Q. What is the Full Form of IBPS ? A. Full Form of IBPS is Institute of Banking Personnel Selection . You Can Visit our Official Website And you Can Apply For Any Job Which Suits your Qualification..
You Can visit our Website And Apply For Any Job Which suits Your Qualification. aap is Post k Liye apply Kar Sakti Hain…. Hello, I need a job please can you suggest me something…..
You Can check latest Government jobs Here.